This week, I finally got the library notification that The E myth Revisited was ready for pickup. I blogged about this book here and here , other times when I felt a desperate need to become a better yoga-teacher-business-woman. I submitted that book request a long time ago, but it’s now, at this very moment when I’m again contemplating my yoga teaching life, both present and future, that this book traveled to my library shelf with my name on it. I checked the book out. Last night I started reading it. Admittedly, I didn’t get very far. Night reading generally happens in 5-page bursts. But I felt like Mr. Gerber was talking to me and I made it through a whopping 46 pages before I nodded off and began to drool. I’m going to do my best to recount what I remember, but this isn’t going to be highly referenced so don’t quote me. In these first chapters, Mr. Gerber presents his argument. He says we people have 3 main personalities that arise when we go into business for ourselves and they are often in conflict. There’s the entrepreneur, the visionary who can look into the future and see that today’s little business is destined to change the way that we do things in the world. There’s the pragmatic manager who likes things organized and labeled and predictable. This one isn’t eager for change and because of this, the manager is often a little stuck in the past. And then there’s the technician. This is the personality that just wants to do the job and do it well. The technician likes to be in the body, working with hands and very much in the present. For us yoga teachers, this is the fascination, love and passion that we have for practicing and teaching yoga. Well, it occurred to me that my yoga teacher, Chase Bossart, talks about the same thing…sort of. He says that it is really helpful to recognize that we have a variety of identities and we behave differently depending on which one we identify with at any given time. And I’d like to add, my identities aren’t always in agreement either. If I’m talking to my sister, I have a certain way of talking, being, and making decisions. And when I’m “Mom,” hanging out with my kids, it’s a really different me. Same goes for time with a friend, being a teacher with a new student, or being a teacher of a long time student. With this in mind, I wondered…what if we gave Michael Gerber’s identities a yogi-spin? How would we relate to these three personalities or ways of identifying if we called the entrepreneur the spirit, the manager the mind, and the technician the body. The fact of the matter is that we all have a spirit, mind, and body, inside us. And if they were equally balanced, we’d be describing an incredibly competent individual. The spirit would be free to forge ahead into new areas of interest; the mind would be solidifying the base of operations; and the body would be doing the technical work. Each would derive satisfaction from the work he does best, serving the whole in the most productive way. Wow. I kind of love this. And it makes we wonder what would happen if I gave my spirit the job of being the visionary, free to forge ahead. Seems like Mr. Gerber has that right. When my spirit has been free to imagine and think big, my mind and body did feel open, courageous and capable. If I don’t get anything else out of this book, I’m glad I got this nugget: Let spirit be the visionary. My initial dip into this book has reminded me that I have aspects of my personality that I could cultivate to become a more balanced person and business owner. Developing a vision of where I want my teaching and my business to be would be so helpful and I love the idea of offering the task, that creative freedom, to my spirit. Listening closely to what I desire, seek and dream for myself might help me to tap into my inner-entreprenuer. If I continue to develop my ability to focus my attention, then my mind will continue to be better suited to carry out the necessary steps to go in the direction of that vision. And if my body stays grounded, rooted, healthy, connected and open, then this beautiful container that moves around in the world will allow me to continue to connect with my Self and with my students in meaningful ways. by the self-proclaimed “World’s #1 Small Business Guru,” Michael E. Gerber. I think it’s kind of funny that he calls himself a guru. 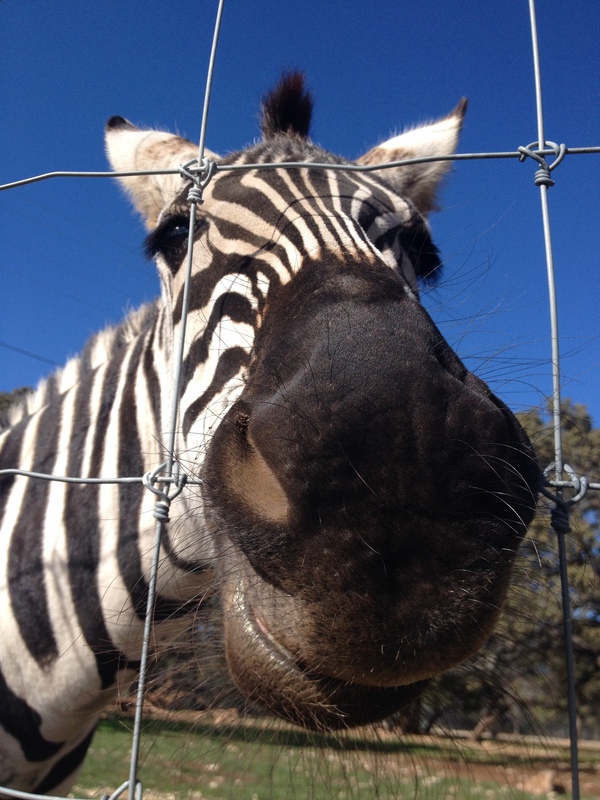 Ever been this close to a zebra? well, I was. IT was awesome. Thank you far sharing this Amanda! I have read this book recently and while I really liked some parts, I found that others would be difficult for a yoga teacher to implement. One of his main ideas is that you should run your business as a template for a franchise, so that anybody could replace you. But I find that in a yoga world a lot depends on student’s connection to the particular teacher, which I appreciate, so replacing the teacher is not so easy. But anyhow, I am looking forward to reading your thoughts as you make your way through the book! oooh. This is such a good comment. I completely agree that having a relationship with a teacher and a tradition is so central to a rich and deep yoga practice. At least it has been for me and the way I teach. There’s an office and a clients and appointments throughout the day. It is built on relationship as a means for personal growth and transformation. There’s also the franchising and tm thing– where yogis come up with a brand and people want to train and learn that approach so there is value there. Of course, there’s opening a studio, too, and it’s these two models where Michael Gerber’s ideas are the most applicable. but man, is “leading with the spirit” interesting right now. I’m excited to see where reading this book might lead, too, SW, and I’d love to hear any thoughts you are willing to share on the topic. Bottom line: I love teaching yoga and I want it to be sustainable and to support a life of balance for me and my fam. oh, and the other thing that I think is really significant from this book is that he says, “you are not your business.” There’s a whole discussion of people who build themselves into the biz “mary’s pie shop,” “Sal’s place” and then you become sort of stuck… With yoga, I think this is really interesting to think about. What we are teaching isn’t really about us. It comes through us and it is a part of us, as teachers, but it isn’t really us. We are transmitting the wisdom in a way that we have come to understand it. A few months ago, I got this big weight removed when I realized that I’m important in this yoga teacher-student exchange. I have a beautiful role to play, but what I’m teaching is separate from me. There was a cautionary tone about it in the book that I think could be useful for yoga teachers to consider. Hi Olga. 🙂 I think I knew that. Check out the comment by Andre… he talks about just this thing of being passionate but not completely invested. Only he says, “not attached to the results.” I think that may be what you are getting at because the investment is totally important, but the attachment to how and when it all works out (or doesn’t) seems to be the very yogic and very important piece. It’s not uncommon in business to have an “exit plan.” This is true for CEOs, though much of what they offer is personality driven, much like a Yoga instructor. What I always take from the various messages relating to viewing yourself (in business) as replaceable is more a practice of non-attachment. Yes; dream, plan and engage. Then let the results be what they will. Non-attachment is so interesting. It actually asks that we be incredibly and wonderfully present with who we are, what we do, how we behave and how we make decisions BUT that we are unattached to the results. You say it so well, Andre. I also like this parallel that you draw between CEO’s and yoga teachers. I can see your point, and i wonder if more yoga teachers –or maybe just me– could see herself as CEO of my biz, what that would mean for my biz. Olga, I got further in the book and must agree with you. The “franchise” model that Señor Gerber is promoting doesn’t work with yoga teaching… or at least the way I envision it working. I ditched the book after getting about half way through. Maybe I’ll read the rest one day. Maybe not. I’m totally into the idea of balance, although I would add in heart or emotions to spirit, mind and body. It’s worth working on I believe – and it’s really interesting to think about that balance as applied to business. Sara, I’d love to hear how you see heart or emotions into the mix. I love this blog entry Amanda! This was a great reflection for me to read as we proceed in forming our networking group and growing our businesses! I’m going to think about using that model of mind/body/spirit when I conceptualize HOW I’ll be designing my work structures. See you soon! p.s. When we chatted on Tuesday there was reverb when you spoke. It wasn’t terrible, and I could still understand you. I’m not sure why that occurred… Not sure if it’s a function of the types of microphones our computers have or what. Just thought I’d mention it. This post is connected to the great conversation we started last week. I’m excited to see where we go as we continue the conversation! I wonder about the reverb… maybe if I use my headphone mic??? Hi Nina! You know, I find it a little difficult to write about what meditation does for me and how it works, (though I have attempted it in this blog) because it either seems too simple, or words don’t do it justice, or talking about the effects require such hyperbole that it just isn’t effective. But you nailed it. Meditation is such a beautiful, and for me essential, piece of the process of becoming a clear, focused and conscientious business person (or mom, wife, yoga teacher, realtor).